I'm usually a coffee drinker but this time of year is when I switch to apple cider. In fact, I usually have a gallon or two in my fridge to drink up but I also try to use apple cider in recipes as well. When cooking or baking with apple cider, I tend to reduce it to a syrup like consistency for a more intense flavor. This time, I used the cider as a braising liquid for bratwurst, which reduced down to a glaze. 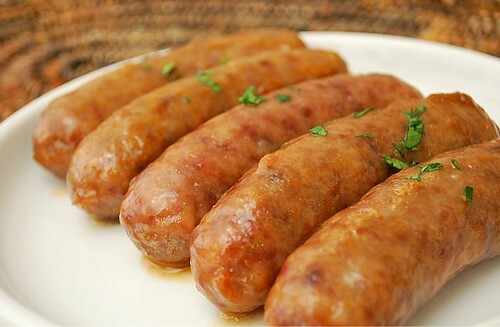 These Cider Glazed Bratwursts had the perfect touch of sweetness from the apple cider, making it a nice change from the traditional beer braised bratwurst recipe. I prepared this with minimal ingredients - 3 to be exact. And preparing these were just as easy. Boil the brats in the apple cider until the cider reduces and thickens down to a glaze, then serve it up in a bun! You could adapt the recipe for the grill if you wanted as well. Either way, it's a great way to serve up brats if you don't want to use beer or if you just want a little sweet apple flavor with your brat. In a large skillet, combine the apple cider, onions, and bratwurst. Bring the skillet to a boil and reduce to a rolling simmer. Continue simmering until the brats are evenly colored and have lost their raw look, about 15-20 minutes, turning them occasionally. The cider will eventually reduce and thicken to glaze the bratwurst. Place the brats in the buns and garnish as desired. Serve hot. hey joelen...it's sarah from tastespotting...have you thought about entering a form of your cider glazed bratwurst (but with italian sausage) into the Johnsonville Recipe contest for a chance at $1,000?! This is my favorite way to cook my turkey sausages, give it a bold flavor. This looks awesome.